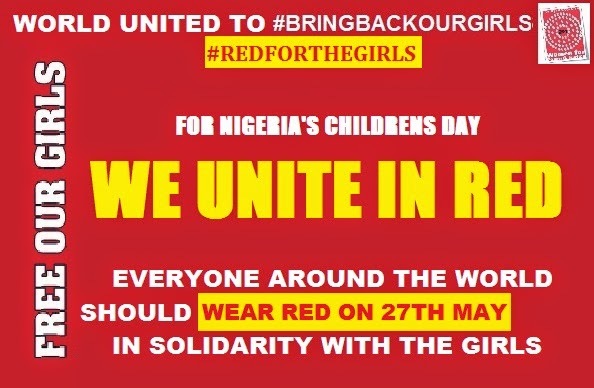 The #BringBackOurGirls and 'Women For Peace and Justice' movements have announced and encouraged everyone around the world to wear red on Nigeria's Children’s day which is marked on May 27, 2014. The movements have called for this to show the world's solidarity with the missing Chibok girls. “This movement is a reminder of how in unity we are powerful. We the people in Nigeria and our friends around the world have brought international support to find the missing girls and have put pressure on the Nigerian Government to do more but until these girls are back with their families it is not enough.” says Aisha Oyebode, an initial promoter of the #BringBackOurGirls movement and a leader of the ‘Women For Peace and Justice Movement. “It is important that we keep the momentum up so that these girls do not become yesterday's news until they are safe. So please spread the word,” concluded Aisha Oyebode. 1. Post the poster with title and hashtag: #BringBackOurGirls #RedForTheGirls on your Blackberry Messenger, Whatsapp, Twitter, Facebook and Instagram. 3. Wear red in solidarity on 27th of May.